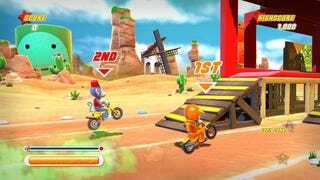 Hello Games' cheerful PlayStation Network stunt 'em up Joe Danger was dinged by at least one person for not having enough monkeys in the game. That lack of simian stuntmen has been corrected with Joe Danger's new downloadable content. Joe Danger's freshly made DLC comes with a little Thanksgiving flavor in the form of collectible turkeys and the sweet Native American headdress worn by Geronim-Joe. Joining him in the new Joe Danger add-on is knight rider Sir Bonehead (who collects Holy Grails), poultry flavored Chicken Joe and Chuckles the Chimp, who wears the outfit all monkeys should—a fez and vest—and collects bananas. See all these new Joes in action in the latest Joe Danger trailer. Then go buy the game if you haven't. It's on sale this week at the PlayStation Store, y'know.